Background: Guangyin Yoga is a small yoga club in Shanghai. For 4 years, the club hasn't been running well with only few club members. Challenge: How to raise Guangyin Yoga’s brand awareness overnight and enroll 300 new members with a small budget? 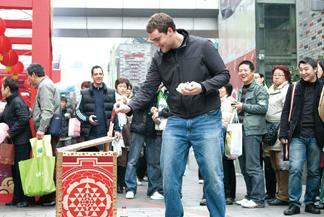 Solution: In the Shanghai CBD we placed a small-sized wooden box in the street. They asked their yoga master to get inside the box. Every time someone passed by, a hand would reach out with our club business card. Surprise! Result: This campaign lasted 15 days, with over 35,000 target directly communicated, 319163 video clicks on the web, and more than $138,000 of free media report. After the campaign, over 2000 people visited the club within a month, and 622 of them became new members,107% more than expected. And the cost: US $74.